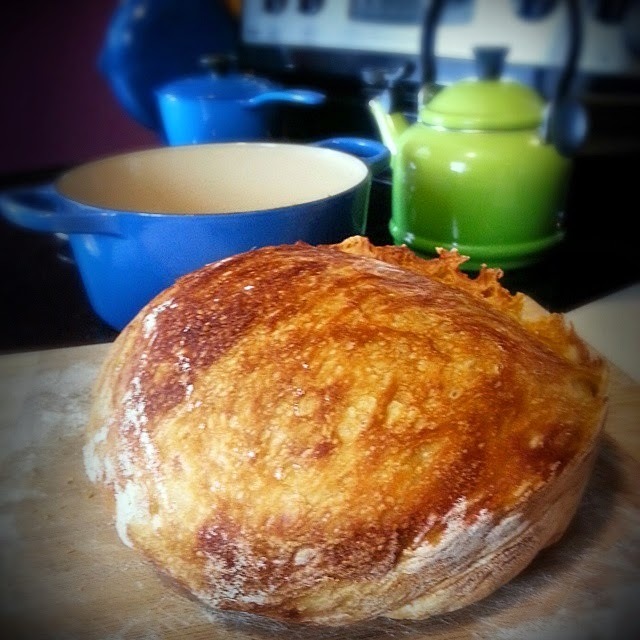 JASON JACK MILLER: SNOW DAY NO KNEAD BREAD! SNOW DAY NO KNEAD BREAD! I mixed everything yesterday at 4pm and let it sit all night. I must've put it into the oven at about 11am this morning, so it didn't sit the full 24 hours. Somewhere else I read to let it sit about 12-16 hours, which is what I did. And I didn't do the towels this time. I shaped the dough into a ball and let it spend its last two hours on a lightly-floured cutting board, and dropped it into the French oven that way. I have a 3.5 quart Le Creuset French oven, and it came out just fine. (I think the recipe calls for a 6 or 8 quart.) So easy and amazing! Bon appetit!